With the change in weather, my skin has become somewhat dull so manual exfoliation and treatments have become a regular feature in my skincare routine. Now, I’m not shy of an overnight treatment or two, as they’re my favourite type to use, but recently I’ve been reaching for something a little extra to give my lacklustre skin a bit of a boost. For actual physical scrubs my number one choice has been the La Prairie Cellular Mineral Facial Exfoliator (who have a great GWP offer on at the moment too, see the full range here). It’s a wonderful scrub which isn’t scratchy on the skin and really works to polish away any dead skin cells, revealing brighter and more radiant skin. It’s the perfect daytime boost and makeup goes on smoother after use, it’s really the perfect product for an instant fix when skin isn’t looking its best. 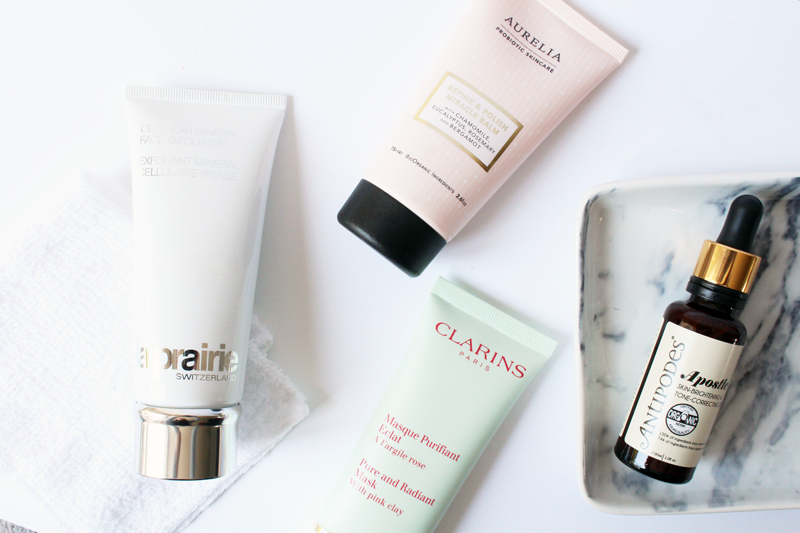 Next if I prefer more of a cleanser/balm with an exfoliating boost, I’ll reach for the Aurelia Refine and Polish Miracle Balm. I spoke about this recently, so won’t go into too much detail, but it really is a great little product. Being a balm addict, it ticks all the boxes on that end of things (ie gorgeous texture/scent) but the added exfoliation, which also doubles up as a mask, just totally wins me over. My skin is always perfectly cleansed, soft and bright afterwards – it’s the perfect pampering treat. Talking of pampering, I couldn’t not mention a mask. The Clarins Pure and Radiant Mask with Pink Clay is one I’ve had in my stash for such a long time. It works as a really gentle clay mask, which doesn’t leave skin feeling or looking dry like some can and really cleanses deep into pores to give skin a more refined look. It’s perfect for congested skin days and it always helps with any blemishes I have too, making it the perfect little boost. Finally, a serum I’ve loved for a long time but have only recently got it back in my stash again, is the wonderful Antipodes Apostle Skin-Brightening Tone-Correcting Serum. It’s honestly one of my favourite daytime serums for brightening skin, as I find that it really does work and helps clear skin too. It’s quite a thin liquid which dries very quickly on the skin (making it perfect for early morning rushing around!) but after about five days of use your skin looks so radiant and glowing! It’s one I reach for a lot as I adore products that really work! So that’s my roundup of products that are perfect for a little added dose of radiance if your skin feels lacking in it. What do you use to brighten your skin when it’s looking a little dull? Some of these products have been gifted, see my full disclaimer policy here.